Emails are imported as PDFs, and any attachments are also included. When you import emails, NVivo creates cases and relationships for the sender and recipients; and classifies the cases and email file. 1 The email is imported as a PDF file and assigned a classification of Email Message. Any supported attachments are also imported and placed in a folder called Email Attachments. 2 A case is created for the sender, and the email is coded to this case. The case is classified as Person with their email address as an attribute value. 3 A case is created for each recipient (including anyone on the CC list), and classified as Person—with the email address as an attribute value. 4 A directed relationship is created between the sender and each recipient, with a type of Emails to, and the email is coded to the relationship. Resize the application windows so that both Outlook and NVivo are displayed on the screen at the same time. In NVivo, open the files folder that you want to import the email into. In Outlook, select the emails that you want to import. Drag the emails into the Files List View of NVivo. In Outlook, save the emails you want to import as .msg files. On the Import tab, in the Notes & Email group, click Outlook. In Outlook, open the email with attachments that you want to import. Drag the attachment into the List View of NVivo. Cases are created for the sender and recipient(s) of the email and stored in a folder called Email. Cases are created for recipients on the CC list but not the BCC list. Cases are classified as Person with attribute values of their name and email address. The entire email is coded to the sender case. Refer to About coding (Coding entire files to a node) to understand the count of coding references for PDFs. If you subsequently import email for existing cases, NVivo matches on the name and email address. If a case with the same name already exists but has a different email address, the new case is renamed—for example, John Smith would be named John Smith (2). A relationship is created between the sender and each email recipient. The relationship has a type of Emails to and is a directed relationship with the sender as the "from" case. The entire email is coded to the relationship. Refer to About coding (Coding entire files to a node) to understand the count of coding references for PDFs. Attachments are placed in a folder called Email Attachments, which is created as a sub-folder at the location where you imported the email. Attachments retain their file type. That is, if the attachment is a Word document, it is imported into NVivo as a word document. A 'see also' link is created to any attachments from the original email. When you open the email in Detail View, the attachment in the header section is highlighted in red to indicate the link. Emails with attachments of a type not supported by NVivo are not imported. Excel files attached to emails are also not imported as attachments. If you want to bring in an Excel file, you should save it first and then import it as a dataset. Email attachments are not classified. 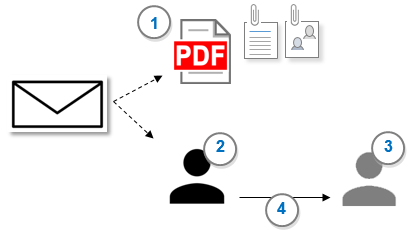 Emails attached to emails are imported as PDFs (like any email). They are placed in the same folder as the original email, not placed in the Email Attachments folder like other attachments. Email attachments that are emails are classified as Email Message and the attribute values are populated from the email. When you open the email in Detail View, the header details of the email (like sender, receiver, date and subject) are shaded in gray. These details are recorded as attribute values in the file classification. If there is a long chain of emails in the one message, the header details of all previous emails are treated as content and are not shaded in gray. NOTE Word Frequency Queries and Text Search Queries will pick up email information that may not be meaningful to your analysis, like names and email addresses. To avoid this, code the email body and then run queries on nodes or cases that code the email content rather than the entire email file.